Publisher: Harper/Collins Pages: 336 pp. A slow and meticulous fiction writer, Howard took years to complete his first novel, “Like Trees Walking” (2007), the fictional retelling of the 1981 lynching of Michael Donald in Mobile. But “Trees” brought Howard the Ernest J. Gaines award, was a finalist for the Hemingway Foundation/Pen Award and brought him support from the NEA, the Bread Loaf Writers’ Conference, the Hurston-Wright Foundation and the New Jersey Council on the Arts. (This same subject was examined with great success in nonfiction by B. J. Hollars in “Thirteen Loops: Race, Violence and the Last Lynching in America,” 2011). “Driving the King” has taken him seven years and I don’t doubt it will bring critical acclaim, literary prizes, if not wide readership. 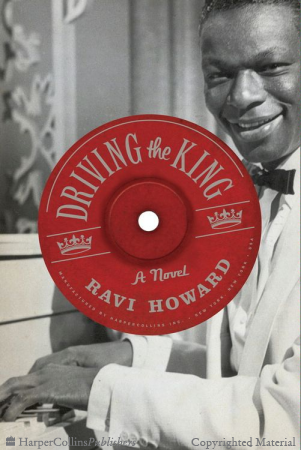 It seems lately the best-seller list has little to no room for thoughtful, ruminative prose, and “Driving the King” is literary fiction without apology. “Driving the King” moves back and forth between two performances by Nat “King” Cole in Montgomery. The first is right after WWII. Returning Sergeant Nathaniel Weary, protagonist and narrator, a childhood friend of the singer, is taking his girl Mattie to a downtown theatre on this special night to hear Cole, one of the Big Voices of the era, and to propose. The show has barely begun when a half-dozen white men, armed with clubs and pipes, storm the stage to beat Cole. Weary jumps on stage and, using the microphone as a weapon, defends Cole successfully. The racist gang leader is sentenced to three years in prison. Nat Weary, who should have received the Montgomery Citizen of the Year Medal, is sentenced to ten years at hard labor in Kilby Prison. The other performance is ten years later. Cole is returning to Montgomery to give the concert that was aborted, this time to a black-only audience. There is a redemption, a satisfaction, some closure in this. In the story of these two evenings Howard, in an unhurried fashion, explores a variety of subjects. Howard proceeds in elegant, restrained prose; he describes life at Kilby, with its physical exhaustion, soul-crushing deprivation, and grinding racism. Every moment, every utterance, every facial expression must be guarded. One inmate would inform on another for a pack of cigarettes and even decent guards become sadists in time. Weary must fight despair. Some inmates climb the fence in order to be shot to death by guards. But Weary stoically endures and, finally, recovers from his ordeal. Now, after his release in 1955, Nathaniel Weary is Cole’s driver, bodyguard and friend. In Hollywood, Cole, dubbed now the Jackie Robinson of television, has just begun the first TV show featuring a black performer. Taking a big chance, footing the bill himself, he is seeking sponsors, but none appears. By the time of the second concert, Montgomery is headed for “Improvement.” A seamstress who refused to give up her bus seat has been arrested, a boycott is under way, and Weary gives a lift to the new minister at the Dexter Avenue Baptist Church, an exhausted, intellectual looking young man, “dressed like a professor in that tweed the teachers wore….He had a paper bag in one arm, and in the other a topcoat and a briefcase with corner marks in the leather from a multitude of books.” “Driving the King” is not an action novel. In fact, there is only one scene that a teenager would appreciate if it were a movie. But it is a beautifully wrought, “quiet” novel and deserves a wide readership. This is a remarkable first novel, impressive and sophisticated. The subject matter presents a big temptation to be hyperbolic, melodramatic, but Roy's voice is calm, reasoned. The story is told mainly in simple declarative sentences and is all the more powerful for it.